Edgewood is located at . According to the United States Census Bureau, the city has a total area of 1.5 square miles (3.9 km2), of which 1.2 square miles (3.1 km2) is land and 0.3 square miles (0.78 km2) (18.24%) is water. As of the census of 2000, there were 1,901 people, 798 households, and 549 families residing in the city. The population density was 1,566.1 inhabitants per square mile (606.6/km²). There were 847 housing units at an average density of 697.8 per square mile (270.3/km²). The racial makeup of the city was 89.69% White, 4.63% African American, 0.37% Native American, 2.26% Asian, 1.32% from other races, and 1.74% from two or more races. Hispanic or Latino of any race were 7.63% of the population. In the city, the population was spread out with 20.4% under the age of 18, 4.7% from 18 to 24, 30.0% from 25 to 44, 28.0% from 45 to 64, and 16.8% who were 65 years of age or older. The median age was 42 years. For every 100 females there were 96.8 males. For every 100 females age 18 and over, there were 96.7 males. The median income for a household in the city was $56,528, and the median income for a family was $68,977. Males had a median income of $39,250 versus $30,263 for females. The per capita income for the city was $33,452. About 2.9% of families and 6.2% of the population were below the poverty line, including 4.7% of those under age 18 and 5.8% of those age 65 or over. In 2010 Edgewood had a population of 2,503. The racial and ethnic makeup of the population was 69.8% non-Hispanic white, 10.6% black or African American, 0.2% Native American, 1.9% Vietnamese, 0.8% Asian Indian, 1.7% other Asian, 0.3% non-Hispanic reporting some other race, 2.7% reporting two or more races and 13.4% Hispanic or Latino. In addition to the county sheriff's department, Edgewood has its own police department, Edgewood Police Department. 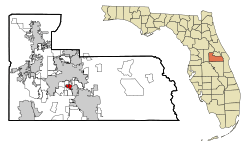 Edgewood, Florida Facts for Kids. Kiddle Encyclopedia.